It’s getting easier to find vegetarian, even vegan, alternatives to products like burgers, milks, and sausage, and now even cheeses are available in vegetarian and vegan varieties. Many vegetarians don’t consider that some of the cheeses they are eating could actually contain unfamiliar animal ingredients. 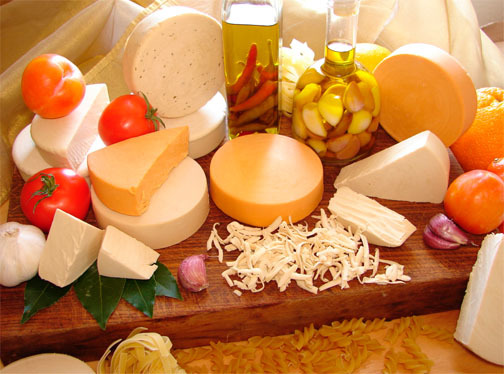 That’s right cheese, a common staple in many vegetarian diets, is often made with rennet or rennin, which is used to coagulate the dairy product. So what are your options if you want to continue eating cheese and remain vegetarian? There are quite a few possibilities. The companies listed below make either all or some of their cheeses with alternatives to rennet or rennin. Microbial enzymes, or vegetable enzymes, which are neither vegetable, nor animal, but are microbes, are now used by several smaller cheese producers for many, if not all, of their cheeses. Most of these companies are smaller and make gourmet-style cheeses, although some larger companies do have vegetarian selections. At this time many of the larger cheese producing companies we contacted cannot guarantee that their cheeses are made without rennet. They often use a mixture of microbial enzymes and rennet. One way to guarantee that you’re getting a vegetarian cheese is to choose one from the “Soy Cheeses/Cheese Alternatives” section. Many of these cheeses are even vegan. Although it may seem like they would all be vegan, since many are called “non-dairy,” they are not. In most soy cheeses on the market at this time you will find an ingredient called casein or calcium caseinate, which is a milk protein used to give texture to cheeses. Several of the companies listed that make cheese alternatives, produce both vegan and vegetarian cheeses, and these are clearly defined. Are you getting enough calcium from cheese alternatives? While a serving of many of the cheese alternatives supplies between 10 to 25 percent of the recommended daily allowance (RDA) for calcium, which is currently 800 milligrams a day for adults 25 and over, you can add to your calcium intake with several vegan foods. Four ounces of tofu processed with calcium sulfate provides between 250 and 756 milligrams of calcium, thus almost meeting the RDA. Other foods high in calcium include collard greens, spinach, soybeans, tahini, almonds, and broccoli. As with dairy products, some of these high calcium foods (nuts and nut butters) tend to be higher in fat, so use sparingly. Even in larger cities the selection of vegetarian cheeses and cheese alternatives is limited, but you do have other options. Some vegetarian cookbooks include recipes for “cheezes,” commonly made from tofu, nuts, or milk alternatives. Two of the most “famous” cheese alternative cookbooks are The New Farm Vegetarian Cookbook, edited by Hagler and Bates, which includes recipes like macaroni and “cheese” casserole and yogurt “cheese” and The Uncheese Cookbook, by Stepaniak, with unusual creations like vegan Gouda and Brie! Whether you want to continue to eat dairy products or are looking for vegan cheeses, there is a wide selection. The key like many other aspects of a vegetarian diet is to read labels and ask questions. If you are not sure whether the cheese you enjoy is vegetarian, and it’s not on our list, try contacting the company. Many of these cheese alternatives are vegan. If looking for a vegan cheese, be sure it is free of casein or calcium caseinate, a milk protein commonly used in soy cheeses for texture. Both are vegan and kosher. Fat-free cheese flavored tofu, several cheese alternatives, cheese spread alternatives. They offer a wide variety of soy cheeses made with organic tofu. Several flavors and varieties including cream cheese style and grated Parmesan style. Vegie Kaas is a vegan cheese spread in regular and smoked flavors. Vegan flavors include mozzarella, sour cream, cheddar, and grated cheese alternative.